Explore a leprechaun-owned brewery and indulge in magnificent rewards accompanied by sensational winning opportunities in the newest slot release from Just for the Win and Microgaming. Although Just for the Win is still considered a rather new software developer, their latest slot releases are quickly gaining popularity across the globe. They are currently releasing each of their slot titles on the Microgaming Quickfire platform, allowing players to easily locate their slot games next to other renowned slots at all Microgaming casinos. The newest slot release from JFTW, in partnership with Microgaming, is called Rainbrew and it features 5 colourful reels along with an unusual 3-5-5-5-3 reel configuration and between 243 and 1,125 Ways to Win. This is the fifth slot release from JFTW and was initially launched in mid-August 2018. The slot further impresses with a marvellous collection of bonus features, such as the newly designed Sidewinder feature, free spins, scatters, and wilds along with a chance to win up to 800 coins in the base game. The action takes place in a stunning brewery owned by a leprechaun, while the reels are magnificently decorated in various pipes and barrels to further compliment the look and feel of the game. With your Microgaming casino no deposit bonus, you will find three wild symbols embedded within the reels, including a standard wild symbol, a Top Wild symbol in blue only appearing on reel 2, and a Bottom Wild symbol in green only appearing on reel 4. Each of the wild symbols will stand in for other symbols to form a win, except for the free spin scatter symbol in the game. The Top and Bottom wild symbols also trigger the brand-new Sidewinder feature within the game. The new Sidewinder feature can be triggered in 2 ways. Once the Top wild symbol in blue is visible on the reels, it automatically unlocks the horizontal reel located at the top of the main reels. Once the Bottom wild symbol in green is visible on the reels, it automatically unlocks the horizontal reel located at the bottom of the main reels. Unlocking one horizontal reel will increase your Ways to Win up to 576. Unlocking both horizontal reels will increase your Ways to Win up to a maximum of 1,125. This allows the new Sidewinder feature to greatly increase your chances of obtaining some phenomenal wins. The Rainbrew slot from Microgaming and JFTW also comes equipped with a free spins round. To activate the free spins round, you only have to land the free spin scatter symbols on the second and fourth reel simultaneously. You will be awarded 6 free spins for 3 free spin scatters and a whopping 10 free spins for 4 free spin scatters. During the free spins round, both horizontal reels will be activated, rewarding you with 1,125 Ways To Win on every free spin. Furthermore, if you lucky enough to display a wild opposite another wild on the horizontal reels, you will see both of them merge to create an expanding wild. What's even more impressive is that you can earn additional free spins each time a free spin scatter lands on the reels during the free spins round. The new Rainbrew slot from JFTW not only impresses with a variety of slot features but also allows both beginner and high roller to enjoy the game thanks to an assortment of betting options. With the Microgaming no deposit bonus, players can start their reel-spinning adventure from a mere $0.10 per spin up to a maximum of $100 per spin. The animation quality and graphics is simply outstanding in the new Rainbrew slot from JFTW and Microgaming. Every symbol within the slot is absolutely sensational which occupies the space between photorealistic and cartoon. Each symbol also compliments the theme of the game and include the leprechaun as the highest valued symbol along with Tankards, Beer Kegs, an Elf, and a variety of Celtic symbols in different colours. 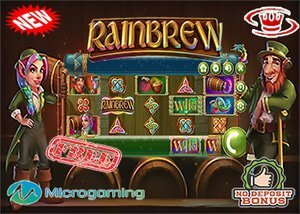 The new Rainbrew slot is an extremely entertaining slot filled with loads of special features that you can enjoy with a Microgaming No Deposit bonus. You can claim your no deposit bonus at Win Palace Casino where you'll receive $35 absolutely free. Newly registered customers can also take advantage of a 200% welcome bonus along with 25 free spins on their initial deposit.